The average distance and time of arrival of the 0.1 cc liquid in vitro pulse injection. Abstract: This paper presents a hydrodissection technique performed with high-speed pulse injection of only 0.1 cc liquid and assess its efficacy, safety, and the level of reduction in posterior capsule rupture complications in phacoemulsification cataract surgery. The kinetic energy of moving objects is directly proportional to the mass and to the square of its velocity. The high energy obtained by high-speed pulse injection of a small amount of liquid ensures highly effective dissection. Since the amount of liquid is very small, the increase in intraocular pressure and the risk of rupture in the posterior capsule due to anterior capsular block are greatly reduced. More importantly, several rotations of the lens material in the capsule with effective hydrodissection facilitate the phases of phacoemulsification and irrigation/aspiration. As most capsule ruptures occur during these phases, the complication rate is thus reduced. The definition of hydrodissection dates back to 1976.1,2 Liquid injection into the cortex was applied to separate the nucleus from the cortex and capsule in extracapsular cataract surgery. In hydrodissection as defined by Fine and still practiced today, liquid is continuously and slowly injected between the cortex and the posterior capsule with the cannula at the edge of the capsulorhexis, advancing from under the anterior capsule forward to the equator. The nucleus rises to the front due to the effect of this liquid passing in front of the posterior capsule, and expansion of the capsulorhexis also occurs. At this stage, the liquid, which is in front of the posterior capsule, is mobilized from the equator to under the anterior capsule through application of vertical compression to the center of nucleus with the shaft of the cannula tip, thereby providing dissection of the connections in the equatorial region. The capsulorhexis opening contracts again when the nucleus returns to its original position. After repeating this procedure from another quadrant, the nucleus is rotated with horizontal movements by placing the tip of the cannula in contact with the periphery of the nucleus.4 Hydrodissection is usually performed with 0.5–1.0 cc liquid using 2–3 cc injectors and 26–27 gauge cannulas. 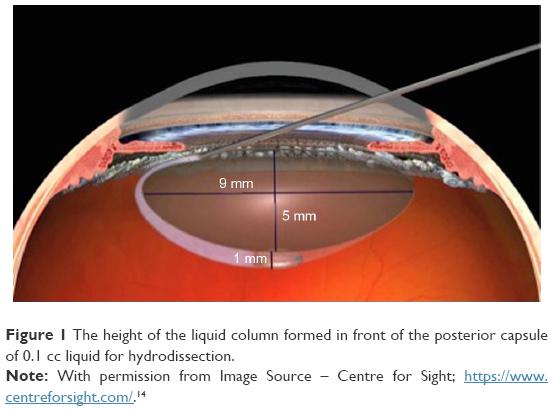 The general approach to hydrodissection in PE cataract surgery is slow injection of liquid. PE cataract surgery can be completed by experienced surgeons without hydrodissection. For this reason, there is a perception that hydrodissection is generally less important than other phases of the surgery. In this paper, a hydrodissection technique is presented that is performed with high-speed pulse injection of 0.1 cc (or even 0.075 cc) of liquid (minimal water-jet hydrodissection-MWH), along with the corresponding mathematical and the physical aspects. This technique is effective and reliable and as it greatly facilitates the PE and I/A phases, during which the majority of PCR occur, and thereby reduces complications. After capsulorhexis, some viscoelastic substance is evacuated by pressing the lower lip of the corneal tunnel incision to prevent an increase in intracapsular pressure during hydrodissection. For high-speed liquid injection, an insulin injector with a low-diameter piston and 27 gauge cannula is used. The cannula is inserted under the anterior capsule as close as possible to equator and anterior capsule is tented, then 0.1 cc liquid is injected with a high-speed pulse (Video S1). This liquid is mobilized under the anterior capsule with slight vertical pressure to the periphery of the nucleus by moving the cannula tip 180° across from the point where the liquid was injected. Then the nucleus is rotated by tangential rotational movements toward the periphery of the nucleus with the tip of the cannula embedded in the cortex. The nucleus is rotated about 60°–120° with each tangential rotational movement, which is repeated 8–10 times so that the nucleus is rotated 2–3 times totally. Hydrodelineation can be applied according to the physician’s preference. After the nucleus is fully mobilized in the capsule, hydrodelineation is applied during each tangential rotational movement by injecting about 0.025–0.05 cc of liquid between the endonucleus and epinucleus (Video S2). The study was performed in accordance with the Declaration of Helsinki ethical principles for medical research involving human subjects. Between 2008 and 2016, there were no complications in the hydrodissection phase in MWH performed on the 2217 PE cataract surgery patients; surgery was done by the author (AT) at Ankara Gülhane Military Medical Academy Eye Diseases Department, Ankara Mevki Military Hospital, and Ankara Sincan Private Odak Eye Diseases Center. A Three hundred and sixty degrees rotation of the nucleus in the lens capsule was not achieved in only 0.5% of the patients, and this was not forced to avoid loss of the zonule. The emulsification of the endonucleus was generally performed with phaco chop and divide-and-conquer techniques. The epinucleus aspiration was performed by tuning to 350–400 mmHg and linearly increasing vacuum. At 180° from the corneal tunnel incision, the equatorial epinucleus is held with low vacuum to avoid capsular rupture complication, pulled toward the center, and then aspirated by the increased vacuum. Then the equatorial epinucleus of other quadrant is rotated with a chopper and brought to the front of the phaco tip and aspirated. After the equatorial parts of the epinucleus are cleaned in this manner by rotating 2–4 times with chopper, it is aspirated by tumbling the other parts. The effective hydrodissection and rotation of the nucleus 2–3 times provided a nearly complete cortex along with epinucleus aspiration (Video S3). It can be found from the formula that it has an area of about 63.6 mm2. When the values are placed in the formula (100=63, 6× h), h=1.57 mm is found. For hydrodissection, a liquid column with a height of 1.57 mm is formed when 100 mm3 of liquid placed between the cortex and the posterior capsule is thought to be homogeneously distributed in front of the posterior capsule just before mobilization under the anterior capsule. If the liquid column height is assumed to be about 1 mm, since the liquid is distributed in some areas other than the posterior capsule, it can be said that even 100 mm3 liquid is a lot for the dissection of an intraocular lens with a thickness of 5 mm (Figure 1). Figure 1 The height of the liquid column formed in front of the posterior capsule of 0.1 cc liquid for hydrodissection. Kinetic energy is the form of energy that a moving object possesses. An object with greater kinetic energy does more work. Kinetic energy (Ek) is directly proportional to mass (m) and velocity (v) squared (Table 1). Calculation of the kinetic energy of 100 mm3 (0.1 cc = 0.1 gr) liquid is used as a preliminary study via video recordings. In vivo (Video S4): The path taken by the liquid in the posterior capsule is 9 mm (=0.009 m). It can be assumed that approximately 14 mJ of energy is used in the hydrodissection of the posterior capsule with 100 mm3 liquid since the 0.00018 mJ kinetic energy calculated as the remaining energy after spent energy in the passage of the liquid in the in vivo lens posterior capsule is negligible. One of the most important complications in PE cataract surgery is PCR. Johnston et al5 reported the rate of this complication as 1.92%, and Lundstroem et al6 reported it as 2.09%. The perception is that the rate is higher during the learning process. Ti et al7 reported this complication rate as being 1.8% in faculty members and 3.4% in resident doctors. PCR rate in PE cataract surgery performed by author in this study using MWH was found to be 0.3% (7/2217). While physicians with surgical experience have no problems during the hydrodissection phase, inexperienced doctors may not always be successful in making a complete hydrodissection. This usually happens due to low-speed liquid delivery resulting from the timidity of the physician. Additional injection because of insufficient hydrodissection will not adequately dislodge the connections in the equatorial region if the velocity is still low. In this case, since the liquid will not spread over the entire area of the posterior capsule, even when the cannula is applied vertically on the nucleus, the liquid will not be capable of being mobilized under the anterior capsule, and so the nucleus will not be completely rotated. Also, excessive liquid, which cannot mobilize under the anterior capsule, may cause increased intracapsular pressure, causing anterior capsule block, and an associated rare PCR complication of a dropped nucleus. In fact, beyond this rare complication, inadequate hydrodissection of the nucleus and cortex will complicate the PE and I/A phases, which occur in most of the PCR cases.8 In the case of inadequate mobilization of the nucleus, the risk of PCR is increased even though the physician is an experienced one. In the study reported by Ti et al,7 4.1% of PCR occurred during the hydrodissection phase, 59.6% in the PE phase, and 24.8% in the I/A phase. When the nucleus cannot be mobilized enough, difficulties can occur in both FE and I/A stages. In such cases, additional viscoelastic and fluid injections may be required, which will result in an increase in the number of entry and exit into the anterior chamber and prolongation of the operation. As a result, pain and discomfort may develop especially in patients who receive topical anesthesia, which may increase the anxiety development in the operator and the probability of developing the PCR accordingly. In almost all our cases (99.5%), the nucleus was sufficiently mobilized in the capsule with MWH, and the emulsification was completed when the endonucleus and epinucleus were easily rotated by the chopper in the PE phase and by keeping the phaco tip center in the safe area. Owing to rotation of the nucleus 2–3 times in the capsule with effective hydrodissection, most of the cortex remains on the epinucleus, and since this is aspirated together with the epinucleus, capsule complications related to the I/A phase are decreased. In approximately 20% of our cases, the entire cortex was aspirated together with the epinucleus, so there was no need for the I/A phase. While MWH provides an effective and easy dissection with a rapid transit of the horizontal plane of the liquid, the mass effect does not cause a serious increase in force and fluctuation in the tissues since the amount of liquid is small. Therefore, MWH has been safely applied in cases with a zonular defect and capsulorhexis extending to the periphery but not beyond the equator. In such cases, due to the absence of mechanical force to mobilize the nucleus during the PE phase, the possibility of additional rupture in the zonules and enlargement of capsulorhexis ruptures are also considerably reduced. In addition, effective mobilization with 2–3 rotations of the nucleus in our patients with an insufficiently dilated pupil allows for the completion of the surgery without the use of iris dilatators. When hydrodissection is not effective in the posterior subcapsular and cortical soft cataract cases, the lens material may not be easily separated from the capsule by vacuum. In such cases, unexpected posterior capsular ruptures, which often occur with a momentary uncontrolled ultrasound energy, can be reduced by MWH. Different techniques have been described in the literature to reduce PCR complications in PE surgery.10–13 Considering that the majority of PCR complications develop in PE and I/A stages, it is thought that MWH, which facilitates these phases and reduces PCR complications, is a simple technique that can be easily learned and applied to any cataract, including pseudoexfoliation cataracts, in which pupil is not too dilated, and phacodonesis (except posterior polar cataract). Due to the high kinetic energy provided by the fast injection of a small amount of liquid, hydrodisection can be made more efficient and without complications. The PE and I/A phases, in which the vast majority of posterior capsular complications occur, can be accomplished much more easily with the adequate mobilization of the nucleus. Paton D, Troutman R, Ryan S. Present trends in incision and closure of the cataract wound. Highl Ophthalmol. 1973;14(3):176. Faust KJ. Hydrodissection of soft nuclei. J Am Intraocul Implant Soc. 1984;10(1):75–77. Fine IH. Cortical cleaving hydrodissection. J Cataract Refract Surg. 1992;18(5):508–512. Howard Fine I, Hoffman RS, Packer M. Hydrodissection and hydrodelineation. In: Michael Colvard D, editor. Achieving Excellence in Cataract Surgery: A Step-by-Step Approach. Los Angeles, CA: University of Southern California. Johnston RL, Taylor H, Smith R, Sparrow JM. The cataract national dataset electronic multi-centre audit of 55,567 operations: variation in posterior capsule rupture rates between surgeons. Eye (Lond). 2010;24(5):888–893. Lundstroem M, Behndig A, Kugelberg M, Montan P, Stenevi U, Thorburn W. Decreasing rate of capsule complications in cataract surgery: eight-year study of incidence, risk factors, and data validity by the Swedish national cataract register. J Cataract Refract Surg. 2011;37(10):1762–1767. Ti SE, Yang YN, Lang SS, Chee SP. A 5-year audit of cataract surgery outcomes after posterior capsule rupture and risk factors affecting visual acuity. Am J Ophthalmol. 2014;157(1):180–185. Varsavada AR, Singh R, Apple DJ, Trivedi RH, Pandey SK, Werner L. Effect of hydrodissection on intraoperative performance: randomized study. J Cataract Refract Surg. 2002;28(9):1623–1628. Roberts TV, Sutton G, Lawless MA, Jindal-Bali S, Hodge C. Capsular block syndrome associated with femtosecond laser-assisted cataract surgery. J Cataract Refract Surg. 2011;37(11):2068–2070. Masuda Y, Iwaki H, Kato N, Takahashi G, Oki K, Tsuneoka H. Irrigation dynamic pressure-assisted hydrodissection during cataract surgery. Clin Ophthalmol. 2017;11:323–328. Masuda Y, Oki K, Iwaki H, Okamoto T, Tsuneoka H. Use of the phaco tip technique for lens cleavage and removal during cataract surgery. Clin Ophthalmol. 2016;10:1925–1929. Masuda Y, Tsuneoka H. Hydrodissection-free phacoemulsification surgery: mechanical cortical cleaving dissection. J Cataract Refract Surg. 2014;40(8):1327–1331. Soda M, Yaguchi S. Phacoemulsification without hydrodissection: semi-crater and split technique. J Cataract Refract Surg. 2015;41(6):1132–1136. Centre for sight. Laser Cataract Surgery. Available from: https://www.centreforsight.com/treatments/laser-cataract-surgery. Accessed December 10, 2017.